This KB article will try to answer questions around how AUSWEB and OpenSRS will handle Registrant Validation. A: The Registrant is the Organization Contact Record (RWI) or Owner Contact Record (UCP). : What does “suspended” mean? Q: What do the other statuses mean? Unverified–The validation process has not been initiated. Pending–The validation process has been initiated, and the validation email will be sent. Verifying–The validation process has been initiated and is waiting for registrant response. Verified–The registrant has been validated. Manual Review–The registrant data has been submitted and is being validated manyally but the Tucows Compliance team. A: OpenSRS will be validating three pieces of registrant contact data: First name, Last name and Email address. When a registrant purchases, transfers, or updates a domain’s registrant contact information, OpenSRS first checks to see if a previously validated record exists for that combination of First name, Last name, and Email Address. If an exact match exists, the domain will be considered validated and no further action is required. If an exact match does not exist, the registrant will be sent an email asking them to validate their First name, Last name, and Email Address. For example, John Doe john@doe.com is different from Johnathan Doe john@doe.com, and both will require separate validation. A: A Registrant will receive an email to validate their contact information on day 1, day 5, day 10 and day 13. 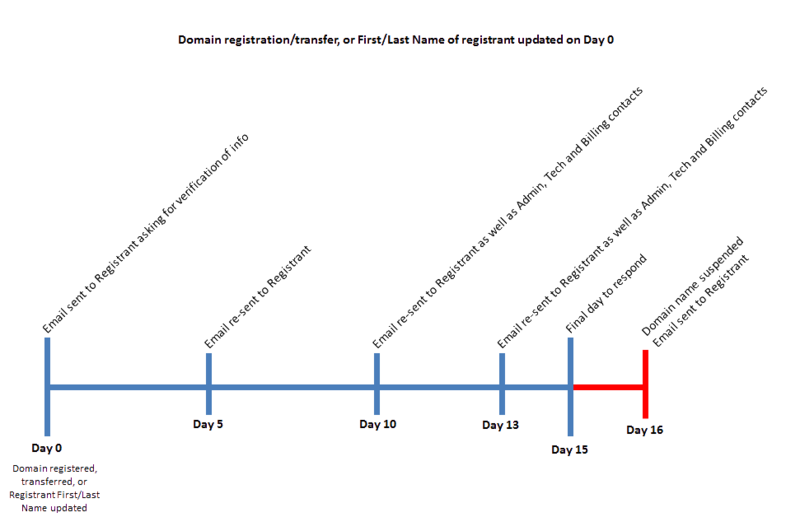 On day 16, if they haven’t validated their information, they will receive an email informing them that their domain name has been suspended. Q: It’s day 80, and the Registrant wants to validate their name. What do they do? A: Instruct them to contact their reseller, who can then resend the validation email. If you are the reseller, you can resend the email via the API or the Control Panel. In the Control Panel, display the domain details, and then, from the Action drop-down menu, choose Resend Registrant Verification Email. If you are using the OpenSRS API, the command is called send_registrant_verification_email. The domain will remain suspended until the Registrant visits the link included in that email. Q: My domain is suspended due to a bounced WDRP or ERRP notice so I can’t receive the validation email. What do I do? A: Registrant or reseller should login to their applicable interface (RWI, MWI, UCP, custom billing system, etc) and update the email address. This will trigger the validation process if necessary. Q. If a domain is suspended, will it still auto-renew? Q: If the Registrant updates their address via the MWI or other interface, does the validation email only go to the new address? Is the previous address notified or required to do anything? A: Registrants will be required to validate the new email address only and only the new address will receive the validation emails.